A system of nine quantum bits (qubits) that is robust to errors that would normally destroy a quantum computation has been created by researchers at the University of California, Santa Barbara (UCSB) and Google. 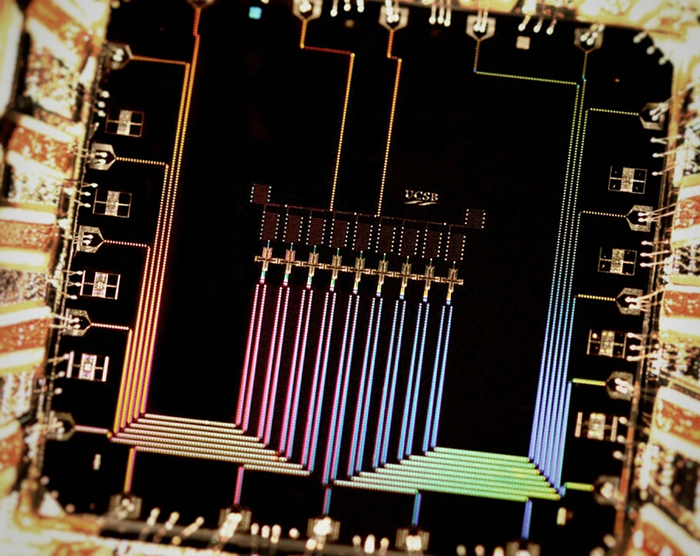 The device relies on a quantum error-correction protocol, which the team says could be deployed in practical quantum computers of the future. 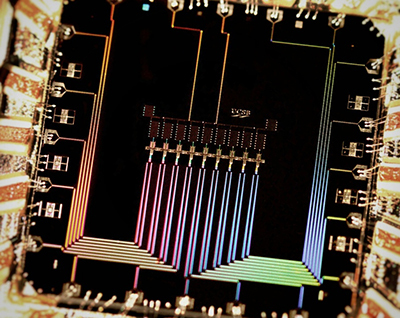 In principle, powerful quantum computers can be built from a collection of qubits. For a qubit based on an electron, for example, these states would be "spin up" and "spin down", with one state representing a logical "1" and the other "0". Each qubit can be in a superposition of two quantum states at the same time and N qubits could be quantum-mechanically entangled to represent 2N values simultaneously. This would lead to the parallel processing of information on a massive scale not possible with conventional computers. However, quantum computers are extremely fragile, and a computation can be easily destroyed by "bit errors" that occur when external noise in the environment affects the values of the qubits. While it is proving very difficult to create practical qubits that are robust enough to eliminate such errors, an alternative approach is to accept that errors will occur and to try to correct for them as the quantum calculation progresses. Now, UCSB's John Martinis and colleagues have taken an important step forward by demonstrating repetitive error correction in an integrated quantum device that consists of nine superconducting qubits. Each qubit is a small circuit consisting of a capacitor and a Josephson junction, and is made from an aluminium film evaporated onto a sapphire substrate. The qubit can be thought of as an artificial atom with information stored in its quantum states. "Our nine-qubit system can protect itself from bit errors that unavoidably arise from noise and fluctuations from the environment in which the qubits are embedded," explains team member Julian Kelly. "We also show that 'more is better': nine qubits protect the system better than five qubits, a critical requirement when moving to more qubits in a real quantum computer of the future." "In quantum mechanics, we cannot measure a qubit without destroying the superposition and entanglement that makes quantum mechanics work," says team member Rami Barends, "but we can measure something called parity – which forms the basis of quantum error correction." The parity is defined to be "0" if both qubits have the same value and "1" if they have different values. Crucially, it can be determined without actually measuring the values of both qubits. The researchers exploited this fact and repetitively measured the parity between adjacent "data" qubits by making use of "measurement" qubits. "Each cycle, these measurement qubits interact with their surrounding data qubits using quantum logic gates and we can then measure them," Kelly explains. "When an error occurs, the parity changes accordingly and the measurement qubit reports a different outcome. By tracking these outcomes, we can figure out when and where a bit error has occurred and correct for it." The more qubits that are involved in the process, the more information is available to identify and correct for errors, explains team member Austin Fowler. "Errors can occur at any time and in all types of qubits: data qubits, measurement qubits, during gate operation and even during measurements. We found that a five-qubit device is robust to any type of bit error occurring anywhere during an algorithm, but a nine-qubit device is better because it is robust to any combination of two-bit errors." Although still a long way off from real-world applications, the researchers say that a "self-correcting" device such as theirs could be a great platform for testing some of the ideas behind error correction – such as protecting a quantum state against so-called phase-flip errors. "We are also now busy improving the quality of our qubits and the materials we use to make them," says Kelly. John Martinis and several other experts describe the benefits and challenges of quantum computing in the podcast "Quantum computing: Challenges, triumphs and applications"